Karen Forest Department Wildlife Protection Unit rangers. Despite being engaged in a civil war with the central government for most of the past 70 years, today the ethnic communities of Myanmar’s Karen state are protecting some of the last full-spectrum biodiversity in Southeast Asia, through a combination of traditional land practices, global partnerships, and contemporary technology. The Karen are an ethno-linguistic group whose traditional territory straddles the Thai-Myanmar border along the Salween River, extends south along the Malay Peninsula to the southern tip of Myanmar, and also includes large populations in the Irrawaddy Delta. 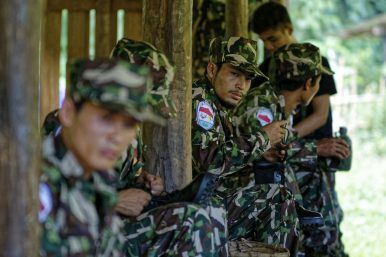 While a 2012 ceasefire agreement has ostensibly paused the conflict, the Myanmar military presence in Karen state has increased since the ceasefire, and military violence against local civilians continues. Habitat, biodiversity, and ethnic self-determination are all threatened by poachers, dam projects, and mining. In addition, recently amended national legislation criminalizes traditional land-use practices and makes ethnic territory in Myanmar subject to government extraction and development. In November 2018, I joined wildlife conservationists Adam Oswell and Tony Lynam to attend a three-day training program for Karen wildlife rangers, sponsored by the Karen Wildlife Conservation Initiative, a coalition of Karen and international NGOs, and the Karen Forestry Department, working to protect wildlife in Karen state. Traveling with us were Calvin Kipling and Kabelo Mmoleti, ranger trainers from the Southern Africa Wildlife College, who had come to lead workshops in advanced tactics for Karen Wildlife Protection Units (WPUs). The training was designed to improve the effectiveness of the Karen wildlife rangers by combining indigenous land stewardship with anti-poaching tactics and the latest cyber tools for conservation management. The training center was a collection of bamboo structures set amid rolling, rocky hills, with lush, forested mountains rising to the west. 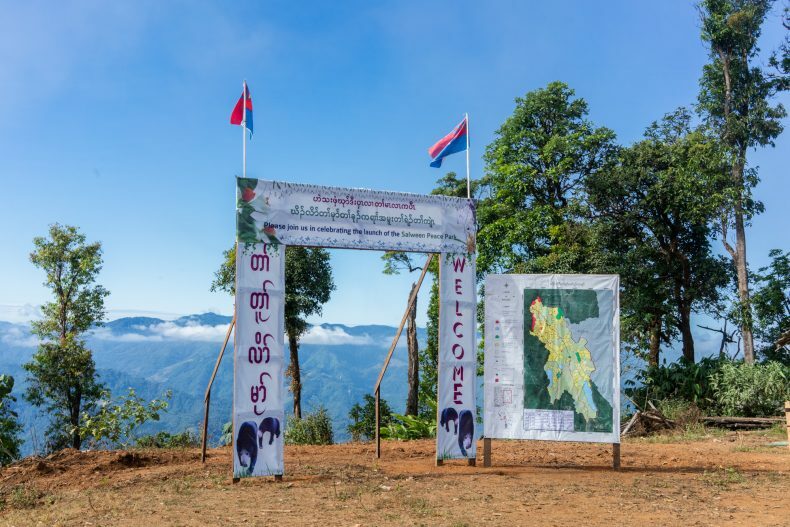 A couple of dozen rangers had trekked here from their posts at five wildlife sanctuaries dispersed across Karen state. The training began with Calvin presenting an eight-step counter-poaching strategy, consisting of: intelligence, threat analysis, crime prevention, operations security, animal security, physical security of rangers, authority and jurisdiction, and incident planning. This structure was a way of bringing organization and methodology to the rangers’ patrols, in which they would sometimes remain in the forest for months at a time. The day was stiflingly hot, and I drank endless cups of 3-in-1 coffee, trying to stay alert amid the heat and the drone of a generator. But the rangers didn’t seem bothered by the heat. They were engaged and inquisitive, and seemed to recognize that they were being offered skills that could help them protect their homeland and way of life. Calvin had worked with Karen rangers before, and during a break I asked him about his previous experience with the Karen communities. Today, the only significant biodiversity remaining in Myanmar is in ethnic areas, including Karen and Kachin states; in central government-controlled areas, land has been subjected to extraction for maximum short-term profit through mining, logging, hydroelectric power plants, and agribusiness projects. Wildlife populations are almost nonexistent. Similar central government plans exist for Karen-controlled areas, including the Hat Gyi dam on the Salween River, and road projects that would increase access for resource extraction as well as for the Tatmadaw (Myanmar military), with a risk of these threats furthering conflict in the region. The Dawei Road development project, which runs from Thailand to the Andaman coast in Myanmar. Unregulated mining and deforestation for industrial agriculture are major threats facing conservation efforts in Karen State. Photo by Adam Oswell/KWCI. The second day of the training, Tony began introducing the rangers to SMART, the Spatial Monitoring And Reporting Tool. SMART is a free, open-source software tool developed by global wildlife organizations to manage and organize conservation programs. After describing SMART’s functions and benefits, he helped them install it on their phones and laptops, then demonstrated how to upload information into the centralized database. As Tony described it, “SMART is software, but it’s also an integrated approach to management of protected areas. It involves having rangers on the ground doing patrols, collecting information on the threats to wildlife, managers who are processing this data, and people who are making decisions based on analyzing the results. Implementing SMART in Karen Protected Areas is a way of combining bottom-up monitoring of ecosystems with state-of-the-art management tools. With almost 100 Karen rangers on the ground in protected areas, working with local communities, the goal is to create a network to report wildlife crime, as well as illegal logging or mining activity, and to stop wildlife poaching before it happens. New Wildlife Protection Unit ranger recruits have their heads shaved in preparation for ranger training. Photo by Adam Oswell/KWCI. That night after dinner, I sat down to talk with a handful of rangers at a long bamboo table. A kerosene lantern hissed in the moist cool air. None of the rangers seemed to see much prospect for peace in the short term, and were resigned to spending their lives in isolation in the forest to protect Karen land, culture, and wildlife. Saw Htoo Shee (an alias) is a patrol leader who has worked as a WPU ranger since 2013. He said, “I joined the WPUs to protect Karen nature and land. If we don’t protect the land, there will be logging and mining in the Protected Areas. I only hope some day we can live with peace and freedom in Kawthoolei,” the indigenous name for Karen territory. “Do you think there will be peace one day?” I asked. Saw Eh Moo, 32, the deputy leader of one of the WPUs, is married with one child, but in the course of a year is only able to return home for one week. “How long do you want to work as a ranger?” I asked him. The Karen rangers and communities are part of the global movement of indigenous groups who choose to stand up for the right to live on their traditional lands, rather than acquiescing to what some may consider to be the inevitable tide of development. The murder of Karen community leader and conservationist Saw O Moo by Tatmadaw troops in April 2018 is a tragic illustration of the intersection of state violence with the struggle for self-determination and land rights in Karen State. Similarly, indigenous activists Berta Cáceres of Honduras and Isidro Beldenegro of Mexico, both recipients of the prestigious Goldman Environmental Prize, were assassinated within 10 months of each other in 2016-17, for their defense of indigenous land against rapacious state and multinational development schemes. As in the protest against the Dakota Access Pipeline at Standing Rock, North Dakota, where Native Americans stood unarmed before thousands of militarized police, leaving their land to be destroyed by a pipeline, a dam, a gold mine, or a palm oil plantation is not an option for the Karen and other indigenous peoples. Banners and maps welcome visitors to Salween Peace Park for the launch. Photo courtesy of KESAN. 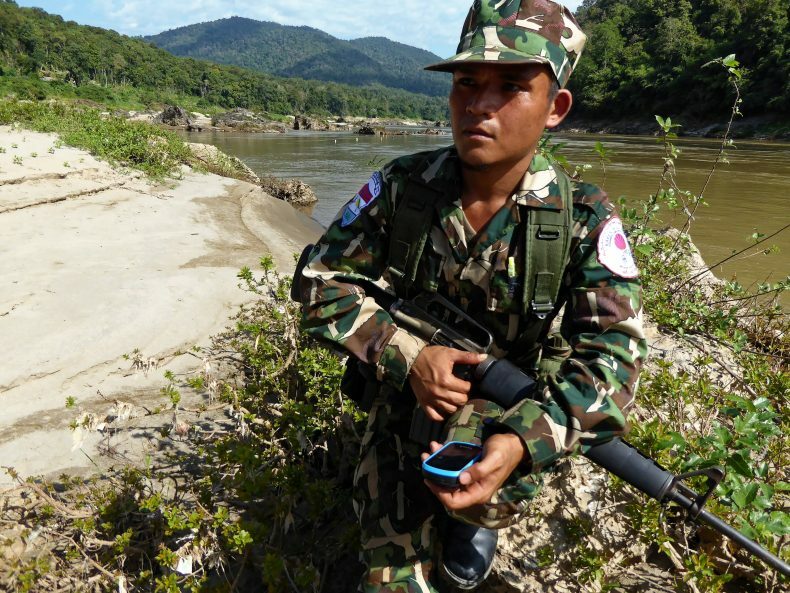 In December 2018, a month after the ranger training, Karen communities launched the Salween Peace Park, a 5,485 square kilometer area designed to “provide a people-centered alternative to top-down, militarized development.” The Salween Peace Park includes the five protected areas that the WPU rangers patrol, as well as community forests and designated ancestral sacred lands, combining these into a vision to fulfill the stated aspirations of the Karen people — peace and self-determination, environmental integrity, and cultural survival. The central government has not recognized the Salween Peace Park, and continues to contest the land rights of Karen and other ethnic peoples in Myanmar. 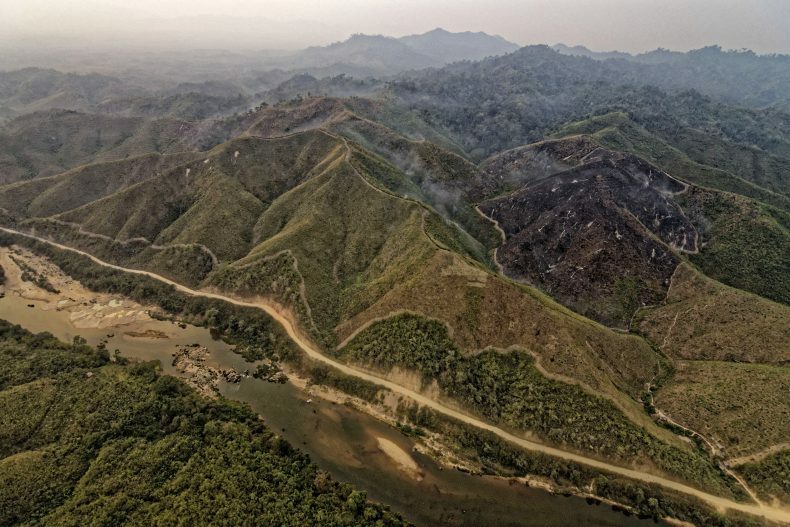 Centralized development programs undermine local autonomy, such as the Hat Gyi dam, which would flood a large area of the Salween Peace Park and displace thousands of Karen villagers. Myanmar’s recently amended Vacant Land Law, which declares all vacant, fallow, and virgin land to belong to the government, criminalizes traditional customary land use, disenfranchising indigenous peoples who have lived generations on their ancestral lands. According to Dr. Robin Roth, associate professor of geography at the University of Guelph, 80 percent of the world’s remaining biodiversity is in indigenous areas. Thus, self-determination for ethnic peoples is a key to preserving biodiversity, while centralized, industrialized development is likely to further destroy it. Karen and other ethnic land rights must be recognized by the Myanmar central government in order to have peace in Myanmar. In addition to bottom-up management and international cooperation, genuine peace and self-determination for local communities are the only way to ensure long-term protection for the wildlife of Kawthoolei and our world. Scott Ezell is an American writer and multi-genre artist based in Asia and California.